The NES-101 model of the Nintendo Entertainment System (also known as the New NES, the New-style NES, the top-loading model, or simply the Top Loader) is a compact cost-reduced redesign of the video game console of the same name released by Nintendo in 1993. Nintendo marketed the NES-101 model as the NES Control Deck, exactly the same as the original NES-001 model, only with a "new design" mark on the packaging. It retailed in North America for $49.99 USD (equivalent to $86.70 in 2018). This was at a significantly lower price than the already released Super Nintendo Entertainment System. The NES-101 control deck came packaged with a redesigned version of the standard NES controller (model number NES-039) shaped very similarly to the Super NES controller. The external appearance of the NES was greatly overhauled and restyled to align its looks to the North American version of the Super NES control deck and to address a number of commonly cited ergonomic problems of the original NES-001 model. The case design was by Lance Barr, who also designed the North American versions of the original NES and Super NES, as well as the later redesigned Super NES. The power and reset buttons now matched the curvature of the new look. The NES-101 does not have an LED power light to indicate the unit is on, as the original NES-001 and SNS-001 included. The most obvious change in the redesign was the removal of the front-loading force-insertion mechanism of the cartridge slot in the original NES-001 model. In that system, the user had to first open the lid of the case, slide in the cartridge, then press it down. The large space inside allowed plenty of room for dust to settle and the contact heads were almost impossible to access and clean without disassembling the system or using the official cleaning kit. Wear and tear was another problem; with continued use, the precision of the mechanism deteriorated and the user would have to poke and nudge at the cartridge to move it to a position that would be read correctly. The NES-101 returned to the standard top-loading method, used by almost all cartridge systems before and since for its ease and reliability. The NES-101 control deck features the same 7-pin controller ports as the NES-001 and is compatible with all the same controllers and peripherals. The console came packaged with a similarly-redesigned version of the standard NES controller (model number NES-039), nicknamed the "dogbone" controller due to its shape, instead of the original NES-004 model controller. While the NES-101 console only came with one controller, the NES-039 controller was also sold by itself and is fully compatible with either version of the NES control deck. The NES-039 controller more closely resemble the Super NES controller, with rounded edges that fit more ergonomically in the hands than the rectangular design of the NES-004 model. The A and B buttons were also set at an angle to mimic the Super NES controller as well as provide better ergonomics. Because of its ergonomic shape, the NES-039 model controller does not fit in R.O.B. 's controller slot. The 10NES authentication chip was completely removed from the system in an effort to eliminate the blinking red power light problem associated with it in the original NES. The removal of the 10NES chip also allows the system to play games that are unlicensed and/or from different regions such as Europe, something NES-001 systems cannot do without a hardware modification. A minor side-effect is that Nintendo World Championship will not work properly since it needs to know when the console is reset in order to go back to the menu. This signal is only provided by a working 10NES on official hardware. The RCA composite video output and audio jacks were removed from the system as well; an RF connection is the only way to connect the system to a television unless one has the console modified to add composite output or uses an RF-to-RCA converter. The original video amplifier circuit path on the motherboard was poorly designed and created faint "jailbar" interference patterns in the game image. The HVC-101 model of the Family Computer is a redesign of the video game console of the same name (commonly known by the shortened nickname of Famicom) released by Nintendo in Japan in the early 1980s. While officially called the Family Computer, exactly the same branding as the original HVC-001 model, it was also marketed as the AV Famicom (AV仕様ファミコン, Eibui Shiyō Famikon) or New Famicom (ニューファミコン, Nyū Famikon) to distinguish it from the original model. It was released in Japan on December 1, 1993 with a retail price for ¥6800, and remained in production until September 2003. The HVC-101 console is stylistically similar to the NES-101 model released in North America a few months earlier, but has some slight design changes to suit the different needs of the Japanese market. The biggest difference between the North American NES-101 model and the Japanese HVC-101 model was the replacement of the RF modulator output with the same multi-AV output port that the Super Famicom uses. This also represented the biggest selling point the New Famicom has over the original Famicom, which only has RF output as well. Thus the New Famicom requires either, the monaural (SHVC-007) or stereo AV cables (SHVC-008) that the Super Famicom uses for output (however, the New Famicom is only capable of outputting mono audio, even when using stereo cables). The Super Famicom's S-Video (SHVC-009) and RGB (SHVC-010) cables are not compatible with the New Famicom, despite having the same connector type. Nintendo also sold an external RF modulator (HVC-103) for users who wanted to connect the New Famicom to a TV set which lacked a composite video input. Like with the Super Famicom, Nintendo did not package an AV cable or AC adapter with the New Famicom - both were sold separately. The New Famicom requires the same AC adapter (HVC-002) as the original Famicom and the Super Famicom. The New Famicom with the Disk System add-on. 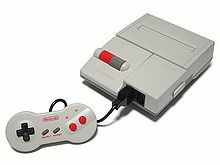 Instead of hardwired controllers like the original Famicom, the New Famicom has the same 7-pin controller ports as the NES (in addition to having a dedicated expansion port for peripherals just like the original Famicom) and came bundled with two connectable controllers (model number HVC-102). The HVC-102 controllers are identical in design to the NES-039 controller, but have much shorter cords. In bringing NES-style control ports to the HVC-101 model made the console compatible with all NES controllers as well (although certain NES peripherals that required the second controller port, such as the Zapper and the Power Pad, will not work on the New Famicom). Because the two packaged controllers are identical in terms of functionality, they both lack the built-in microphone that the original Famicom's second controller has in place of the Start and Select buttons. The HVC-101 has a flat surface in contrast to the convex surface of the NES-101. This was done in order to make the New Famicom compatible with the Disk System add-on, which uses a RAM Adapter that plugs into the console's cartridge slot in order to interface with the main Disk System unit. Peripherals that work on the New Famicom (rather than on the original Famicom) were sold the Famicom Family New (or FF New) marking, but aside from the aforementioned hookup cables, the only licensed peripheral that was released with this marking was the New Hori Commander (HFC-07) controller, which was the only licensed third-party controller in Japan that has an NES-style controller plug. There are two known revisions of the NES-101; both have redesigned circuit boards that improve video output quality. The first has a Nintendo AV multi-out port (the same used in the Super NES, Nintendo 64, and GameCube) that replaces the RF jack completely. The other looks exactly the same as the rest with the RF video output jack and channel select switch, but with excellent video output quality. These versions were replacements for those who sent their original NES-101 systems to Nintendo with a poor quality video complaint. These models are extremely rare as they mostly came as replacement units from Nintendo, but the revised AV model was also found in stores such as Meijer and Radio Shack. All PAL units, model NESP-101, were shipped with the revised motherboard and cleaner RF output, but video output used the 50 Hz PAL standard rather than the 60 Hz NTSC. The PAL versions also do not have a channel select switch. They also have some minor cosmetic differences. On NTSC top loaders, the RF out panel is made from the same light gray plastic as the top shell. On the PAL version, the RF out panel is made from the same dark gray plastic as the base shell. The PAL console also lacks an 1800 service hotline sticker. ^ a b c "The New NES". Nintendo Power. Redmond, WA: Nintendo of America, Inc. October 1993. Retrieved December 12, 2018. ^ "NES Game Pak Troubleshooting". Nintendo Customer Service. Nintendo of America, Inc.
^ "NES Video Problems". Nintendo Customer Service. Nintendo of America, Inc.
^ "Nintendo Entertainment System". Nintendocosmos. Archived from the original on November 9, 2014. Retrieved January 28, 2019. ^ Chad Margetts; M. Noah Ward (May 31, 2005). "Lance Barr Interview". Nintendojo. Archived from the original on July 22, 2016. Retrieved January 28, 2019. ^ "修理の受付が終了した商品 サポート情報" [List of Products That Are No Longer Accepted for Repairs]. Nintendo Homepage (in Japanese). Nintendo Co., Ltd.
^ "4-2. ニンテンドーDS Lite開発スタッフインタビュー" [Interview With The Nintendo DS Lite Development Team]. Nintendo Online Magazine (in Japanese). Nintendo Co., Ltd.
^ "ニューファミコンとスーパーファミコンジュニアの製造が9月で終了" [New Famicom and Super Famicom Jr. Production to end on September]. Famitsu.com (in Japanese). Gzbrain Inc.
^ "HVC-101". Retrieved February 21, 2009. ^ Niizumi, Hirohiko (May 30, 2003). "Nintendo to end Famicom and Super Famicom production". GameSpot. Retrieved January 11, 2014. ^ "HVC: Family Computer (Famicom)". Retrieved February 8, 2010. ^ "Nintendo AV Famicom (HVC-101)". i64X. 2012. Archived from the original on February 24, 2018. Retrieved January 28, 2019. Cords on the newer controllers are also slightly longer than those found on the original Famicom, though still much shorter than North American NES cables. ^ "AV Top Loader". Retrieved December 28, 2009. ^ "GameTechUS's rare RF redesigned circuit board". Retrieved June 1, 2010. ^ Anderson, Dain. "NintendoAge » Users » Photos » Dain". www.nintendoage.com. Retrieved April 16, 2018. ^ "Nes Toploader with AV Output". Retrieved December 30, 2009. ^ "Nes Toploader with AV Output". Retrieved March 9, 2014.